Cladistic analysis of morphological characters is the main technique used for studies of the relationships of living and fossil vertebrates. 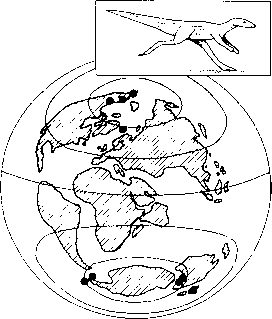 The result of a cladistic analysis is a cladogram, such as those in Figure 1.7. A cladogram is a branching diagram that links all the species, living and fossil, that are under investigation, and the branching points, or nodes, mark points at which shared characters arose. A cladogram is not an evolutionary tree because there is no absolute time-scale, although the relative order of nodes is shown. The cladogram shows the closeness of relationship, or recency of a common ancestor shared by two species, by the arrangement of the groups—the closer they are to each other, and the shorter the linking lines, the closer is the postulated relationship. A cladogram is constructed after an assessment of characters. It is important to find shared derived characters (synapomorphies), features that are shared by two or more species, but nothing else. Synapomorphies are distinguished from primitive characters, which may be widespread outside the group under study. When Jefferies (1986,1997) and Peterson (1995) were trying to sort out relationships within the Deuterostomia (Figure 1.7), they looked for features that would support particular pairings of groups. Jefferies (1986, 1997), for example, argued that most of the calcichor-dates and the chordates shared a tail, a feature not seen in other groups. Peterson (1995), on the other hand, noted that hemichordates and chordates share gill slits, a unique character of these phyla. The key to distinguishing synapomorphies, characters that are potentially useful in cladistic analysis, from primitive characters is outgroup comparison.The out-group consists of everything that lies outside the group under study (the 'ingroup'). In the analyses of deuterostome relationships, the outgroup consists of all non-deuterostomes, anything from banana trees to clams, worms to viruses. For practical purposes, the outgroup is usually selected as organisms that are closely related to the ingroup, so that meaningful comparisons can be made. The tail and the notochord are synapomorphies within Deuterostomia,because other animals lack these characters. Other features shared by all deuterostomes, such as a gut and a nervous system, are useless in reconstructing their phylogeny as members of the outgroup (e.g. worms, arthropods, molluscs) also have these characters. Character discovery and analysis is a complex and time-consuming business. The cladist studies the anatomy of all the organisms of interest in detail, identifying unique and shared characters. There are no objective rules about what is and is not a character. In looking at theropod dinosaurs and basal birds, some specimens have feathers and others do not. Does one code a single character—feathers (present, absent) — or look into the anatomy in much more detail, and identify several kinds of feathers, from full flight feathers to wispy down 'hairs', and several detailed aspects of the anatomy of the feathers under the microscope? Character states are generally coded 0,1, 2 ..., and listed in a data matrix, a table of species/specimens versus characters. Well-established computer programs, such as PAUP, hennig86, NONA, MacClade, and others, are used to process the data matrices and extract patterns of relationships that are expressed as trees. Derived characters indicate whether a group is monophyletic, that is, it arose from a single ancestor and includes all living and fossil descendants of that ancestor (Figure 2.9(a)). Most familiar named groups of animals are monophyletic groups (also termed clades): examples are the Phylum Chordata, the Subphylum Vertebrata, the Family Canidae (dogs), and so on (see Box 2.3). All members of the clade share at least one derived character. Fig. 2.9 Cladograms showing (a) a monophyletic group, (b) a paraphyletic group, and (c) a polyphyletic group, and the presence and absence ofhypothetical characters A and A' (character A' is convergent on [very similar to] character A). In the monophyletic group (a), all species have character A, a synapomorphy of the clade. In the paraphyletic group (b), some species have lost the synapomorphy A by transformation (e.g. the keratinous scales of reptiles are transformed into feathers or hair). In the polyphyletic group (c), the apparent shared characters (A, A') are convergences and the ultimate common ancestor of the two clades lacks that feature. What synapomorphy distinguishes animals as a monophyletic group?